The Ferrari F8 Tributo and McLaren 720S are about to get a new rival from Aston Martin. Aston Martin has arguably stolen the show at Geneva this year, with the unveiling of not one, not two, but three crowd-pleasing concept cars. The Lagonda All-Terrain Concept previews the automaker’s upcoming luxury SUV, while the AM-RB 003 gives us a taste of Aston Martin’s third mid-engined hypercar. We already knew these two models would be revealed at the show, but Aston Martin also revealed a surprise new concept car that revives the iconic Vanquish name. Dubbed the Vanquish Vision, the new concept provides a preview of Aston Martin’s first series production mid-engined supercar positioned below the Valkyrie and AM-RB 003 hypercars that will rival the Ferrari F8 Tributo and McLaren 720S. 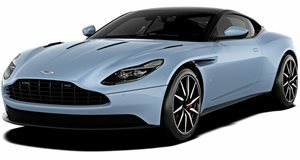 "Firstly, what a pleasure to revive the Vanquish name. Synonymous with our series production flagships, it felt entirely appropriate to attach it to such a significant car,” said Andy Palmer, Aston Martin Lagonda President and Group CEO. Aston Martin says the Vanquish Vision Concept continues the philosophy pioneered in the Aston Martin Valkyrie and distilled into AM-RB 003, with "the pursuit of weight, packaging and aerodynamic efficiency informing every aspect of the design and engineering”. Technical details are scarce, but Aston Martin has confirmed the production version of Vanquish Vision Concept will feature a version of the automaker’s new V6, which will debut in the AM-RB 003 in hybrid turbo form. In contrast to the Valkyrie and AM-RB 003’s all-carbon fiber construction, the Vanquish Vision Concept features a bespoke bonded aluminium chassis, developed under the guidance of mid-engined specialist and Aston Martin Chief Technical Officer, Max Szwaj. As for the design, the Vanquish Vision Concept clearly adopts the same design language as the Valkyrie with similarly-shaped headlights and a similar aerodynamic front bumper, but the overall design looks less extreme as you would expect. "The Vanquish Vision Concept has a more seductive and less technical appearance than Aston Martin Valkyrie and AM-RB 003, but it’s still extreme in terms of visual gestures,” Miles Nurnberger, Aston Martin Director of Design, explained. After its Geneva debut, the Vanquish Vision will undergo extensive testing the hands of Aston Martin test drivers Matt Becker and Chris Goodwin before the final production car is revealed.